When Cynthia Goldsmith hears the word “flu,” the image that immediately comes to mind isn’t one of sniffling noses or feverish foreheads. She thinks of a football-shaped pincushion, with a thick envelope spiked with tiny, thin rods. She sees the shape of the virus. It’s the same for any virus that Goldsmith images under her electron microscope lens at the U.S. Centers for Disease Control and Prevention (CDC) in Atlanta, Georgia—capturing visuals of some of the tiniest, deadliest agents in the world. Since she began working at the CDC in October 1983 as an electron microscopist, Goldsmith has encountered many infectious viruses. She has examined fatal strains of the Ebola virus during the 1995 outbreak, was the first to identify that coronavirus is the virus that causes severe acute respiratory syndrome (SARS) in 2003, oversaw the first scanning electron microscopic image of HIV in 1984, and captured as many as 35 individual of orthomyxovirus samples, which causes the flu. You probably have seen Goldsmith’s work. Her images of viruses have been showcased on the front cover of magazines, textbooks, news websites, and even on Science Friday on multiple occasions. At the Infectious Diseases Pathology Branch at the CDC, she collaborates with pathologists, molecular biologists, and researchers. 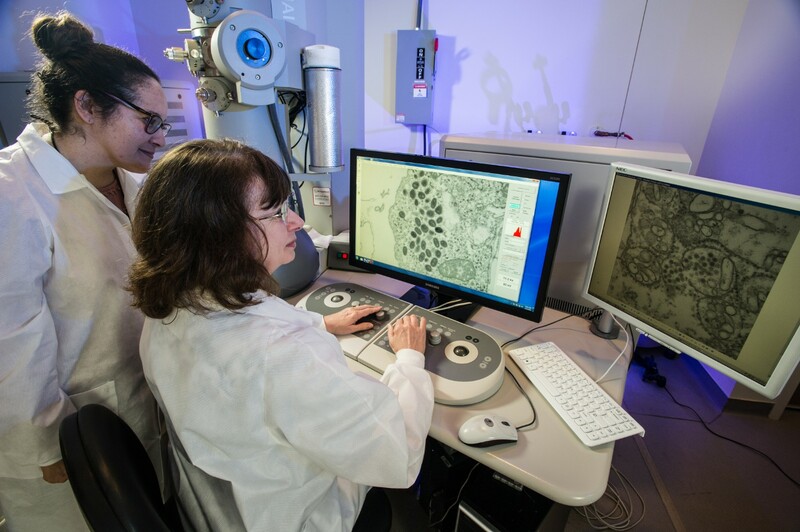 Using tools such as a lab-grade microwave, an oven to help embed specimens in resin, and a 120 kilovolt transmission electron microscope, she can create various views of viruses in black and white. Providing these images helps researchers visualize the specimens that they work with every day, but remain unseen with the naked eye. But, Tumpey concedes that there’s a personal interest in seeing the images as well. In the summer of 2005, Tumpey and a team of researchers got that opportunity to see one of the pathogens for the first time—the virus that caused the 1918 Spanish flu epidemic. The virulent strain of influenza reached the small Alaskan town of Brevig Mission, killing 72 of the 80 residents. In 1997, pathologist Johan Hultin received permission to obtain a piece of a victim’s lung tissue that had been preserved for decades under permafrost in order to try to isolate the 1918 flu virus. Years later, Tumpey, collaborating virologist Jeffrey Taubenberger, and a team of researchers were allowed to study the tissue sample to better understand the genes and proteins that contributed to its high virulence. The team reconstructed the 1918 virus—slowly and carefully sequencing the whole genome bit by bit—leading other research groups to develop better antivirals. When they completed the genome, Goldsmith came in to the look at the isolate and took images with the transmission electron microscope. 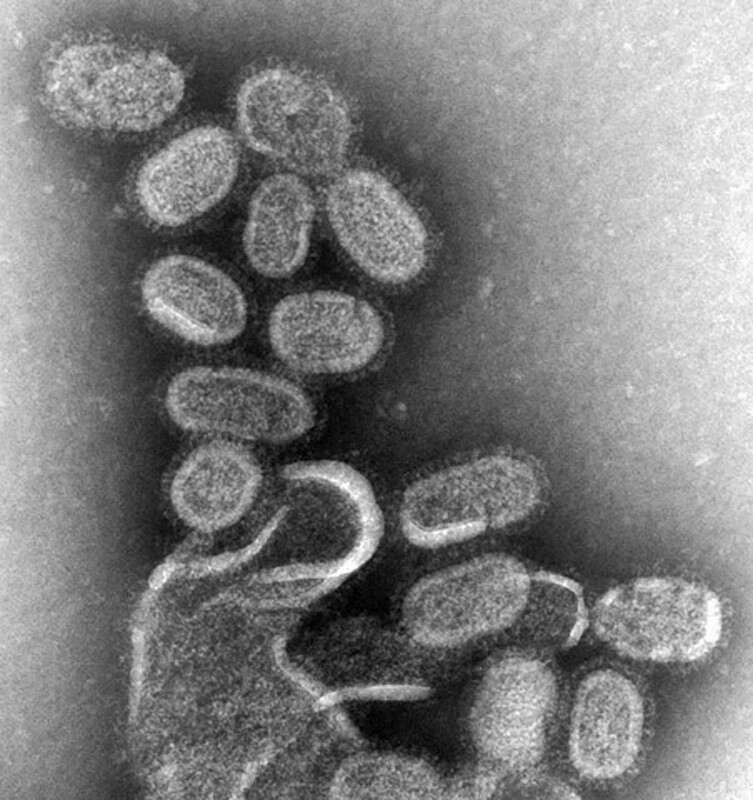 While the flu virus can come in different shapes and sizes, the 1918 flu virus’ shape was similar to the most common appearance of orthomyxovirus: “spherical- to oval-shaped particles with prominent spikes projecting from the surface of the particles,” Goldsmith describes. “I haven’t seen any other images of people doing [electron microscopy] on that virus,” Tumpey says. 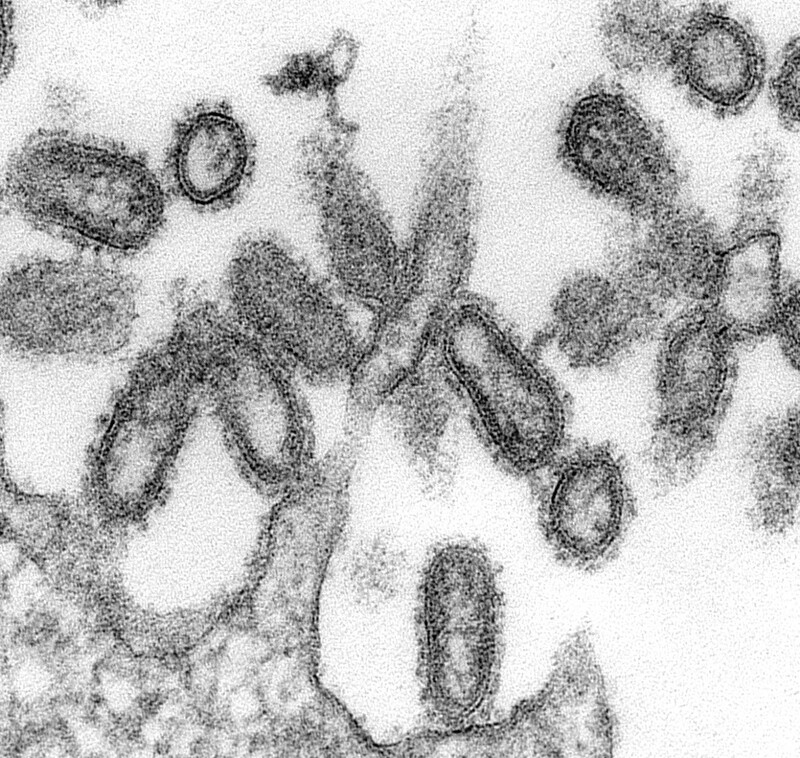 The series of images Goldsmith produced for the study might not only be the first, but the only electron microscope visuals of the 1918 flu, he says. The series of images that Goldsmith snapped of the 1918 flu virus, all in the public domain, has since been widely featured in media, textbooks, and other publications—”just about every newspaper that I saw, it was on the front cover in October of 2005,” Tumpey says. Different sample preparation techniques can provide different information about the nature of the virus, Goldsmith explains. For instance, a negative stain is a speedy method that helps Goldsmith quickly prepare individual growing viruses from a batch of lab-cultivated cells for imaging. A thin section, on the other hand, not only gives cross-section views inside particles, but also gives hints about where the virus is growing in the cell—and the location of a virus informs her a lot about the nature and type of virus. 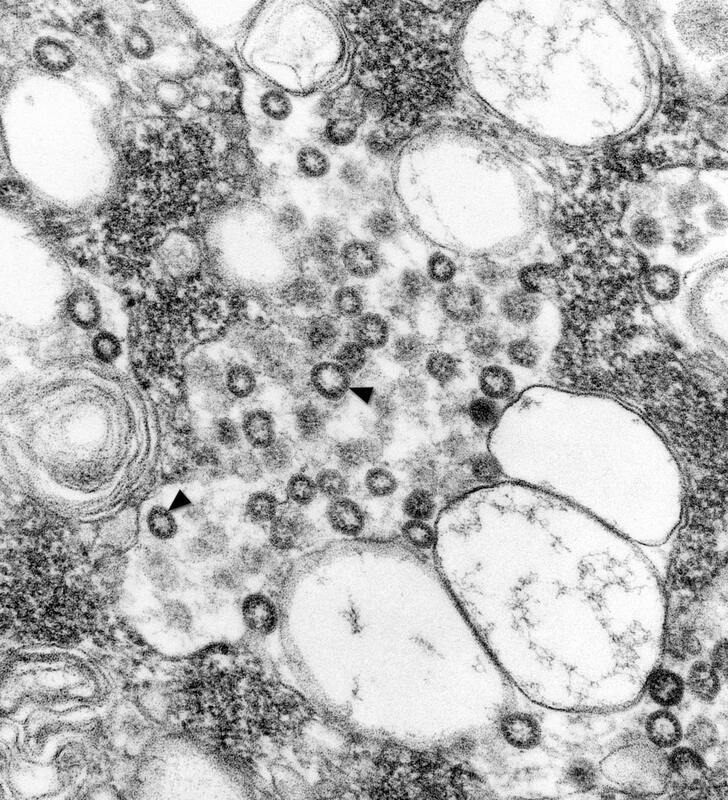 Enteroviruses, a group of viruses known to cause polio and hand, foot, and mouth disease, commonly accumulate in the cytoplasm, Goldsmith explains, while coronaviruses, which infect the nose, sinuses, and upper throat, invade the Golgi complex. “Influenza viruses bud at the surface and so do retroviruses. Most DNA viruses reproduce in the nucleus,” she says. By finding viruses in different areas of a cell, she can better identify them. Goldsmith’s images from the electron microscope can diagnose viruses down to the family, she says—helping researchers identify herpesvirus, poxvirus, orthomyxovirus, and so on. Identifying the correct pathogen for a disease can be critical, especially during outbreaks. In 2003, China was struck by an epidemic of severe acute respiratory syndrome (SARS), a serious form of pneumonia that can cause difficulty in breathing and sometimes death. The respiratory virus spread to more than two dozen countries around the world. Laboratories around the world were studying the virus and looking at it with negative staining. 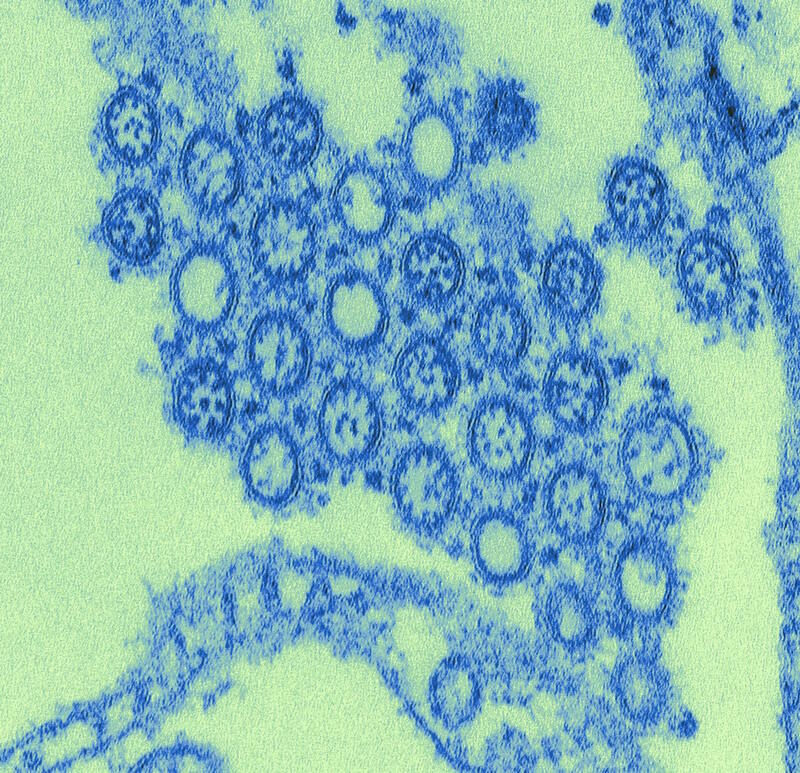 But the negative stain made the viruses look like undistinguished spheres that lacked details around its surface, Goldsmith explains. When Goldsmith received cell cultures cultivated by scientists at the CDC, she decided to look at it with thin section instead. “When I looked at it, it was just obviously a coronavirus by the way it grew in the cell,” she said. With the thin section, she was able to see that the virus budded to the Golgi complex, which led her to deduce that it was a novel coronavirus. Once Goldsmith had identified the virus as a coronavirus, other tests were done at CDC—immunohistochemistry, PCR testing—that validated her observation. Within three days, the center had examined a separate isolate from a different patient that helped to confirm that it was the virus causing the outbreak, she says. “It was the initial thing, that it was a coronavirus, that was helpful to the scientists so that they could pinpoint which test to use,” Goldsmith says. Although it’s a technical process, the images are striking—and, Goldsmith would argue, artistic. Goldsmith might later digitally color the images to help bring out the virus from the cell debris. But she finds the original black and white images—taken straight from the scope—are more captivating. *Editor’s Note 3/27/2019: A previous version of this story misstated that the spikes of the SARS coronavirus could be seen in the thin section image. It has been corrected and we regret the error.